Curry lentil soup is hearty, satisfying, and packed with flavor! Feel free to spice it up even more with hot peppers or to balance out the taste with some avocado. This soup makes for great leftovers and can even be prepared in multiple ways. Sick of eating soup? Try eating the veggies and beans without the broth on top of a whole grain or corn tortilla for curry tacos or even adding the lentils and veggies to a big old salad. 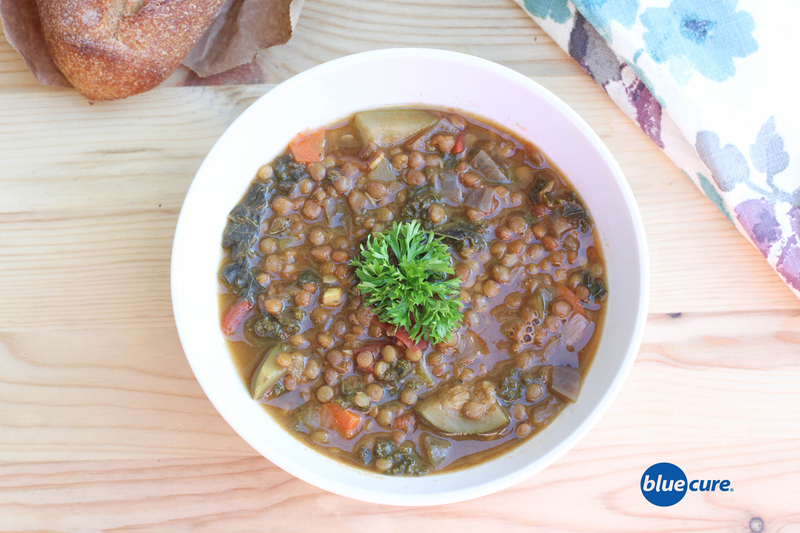 Weekdays can be busy, but there are no excuses for fast food when you have leftover lentil soup in the fridge! Wash and chop the veggies. First, mince the garlic and sauté in a large pot with a small amount of water. Then, add in the onions and sauté until translucent. Add in the carrots, zucchini and sauté until they start to soften. Continue to add more liquid as needed for sautéing. Add in the spices and mix well. Pour 4-6 coups of liquid in the pot with the veggies. Rinse the lentils and then add to the pot. Bring the water to a boil and then reduce heat. Add the kale and the tomatoes to the soup and all the soup to continue cooking until the lentils are soft and the veggies are desired texture. Serve with a side salad and/or whole grain bread. Dish the soups into bowls and garnish with fresh cilantro or parsley.